New wave hero Agnès Varda and French artist JR light up this endearing odd-couple road trip into the remotest corners of France. 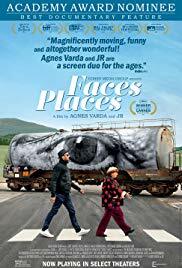 French villagers got a surprise when legendary director Agnès Varda, then 88, paid them a visit along with her new friend, the edgy 33-year-old artist known as ‘JR’. The pair took photos of local characters, blew them up and hung huge murals on local buildings, before jumping back into their travelling photo booth and heading off for the next spontaneous stop. Well, that’s how it appears in this delightful documentary that spares us the behind-the-scenes research and zeroes in on its characters, from the villagers themselves to Varda and JR. Known for iconic French new wave films such as Cléo from 5 to 7, Varda is a cheerful, diminutive eccentric with a big heart. JR is an elusive hipster who, as a vexed Varda notes, is constantly wearing sunglasses – but he’s also very kind to old people. Compassion, ageing, memories, art: Varda explores them all as she revisits scenes from her youth, memorably recalling the naked men she would photograph for her art. These new subjects feel no less fascinating to her, whether they’re waitresses, farmers or goats. Most revealing are the giant portraits of dock workers’ wives, looming over the workplace as their husbands beam with pride. In terms of feminism and politics, Varda doesn’t bang a drum loudly, but her choices speak for themselves – and with an affectionate smile.